Whenever I’ve started a new job in the past, I’ve had one all-consuming fear. I never tell anyone this. But it’s absolutely true. Am I reaching out to the right person? Is this project done the right way? Am I prioritizing the right things? I’m hesitant to complete even the most basic tasks because I don’t want to do anything dumb in front of my new team. I don’t believe I’m the only one, we’re all thinking this when we start new jobs. We’re unsure if we’re good enough to deserve the new job and feel lost with day-to-day tasks like knowing who to reach out to on different projects. The first few months on any new job feel overwhelming because of this. Then as a manager, I find it’s easy to forget what it feels like as a new employee. I’ve internalized so much company knowledge that I completely forget everything that I had to learn myself. It’s the curse of knowledge. Which only makes the problem worse because I end up providing only a small amount of the information that the new employee needs in order to feel comfortable in the new role. That’s the secret that employees aren’t telling you. They feel lost, are unsure of themselves, and desperately want to avoid appearing dumb. What’s the purpose of onboarding? Onboarding has one simple goal. Get new employees completely ramped up and integrated into the team as fast as possible. It’s not just a cold-hearted desire of a manager trying to maximize the productivity of the team. It’s also a huge benefit to employees themselves. Until a new employee is fully ramped up, they’re constantly doubting themselves. It all stems from that fear of not wanting to appear stupid. As their manager, it’s our responsibility to get them through all the basic onboarding tasks, get them to build authentic bonds with their team, and set them up for making an impact as early as possible. The smoother we can make learning how to work on a new team, the faster that new employees will feel confident and have the ability to do their best work. The company and the new employee both benefit from an intentional onboarding program. Onboarding seems like a lot of work, why not skip it? It will take several months before an employee is adding genuine value instead of several weeks. The quality of all their work will suffer during the first year because they’re not aware of all the resources that the company has provided them with. Some new employees will feel too overwhelmed and quit within the first 6 months. This increases your turnover and forces you to spend time and money doing a recruitment round all over again. Other employees won’t be sure who the new person is and won’t be as eager to work with them, lowering the quality of their work too. Because the work quality will be lower from the new employee, the hiring manager of the employee will have a harder time hitting their goals and milestones. Yes, onboarding can be taken too far. Overly rigid onboarding processes that last for 6 months may even cause more harm than good. But every company of any size needs at least a basic onboarding system in place to get new employees integrated. Considering the costs of not having one, it’s a straightforward way to improve employee retention, productivity, and satisfaction. 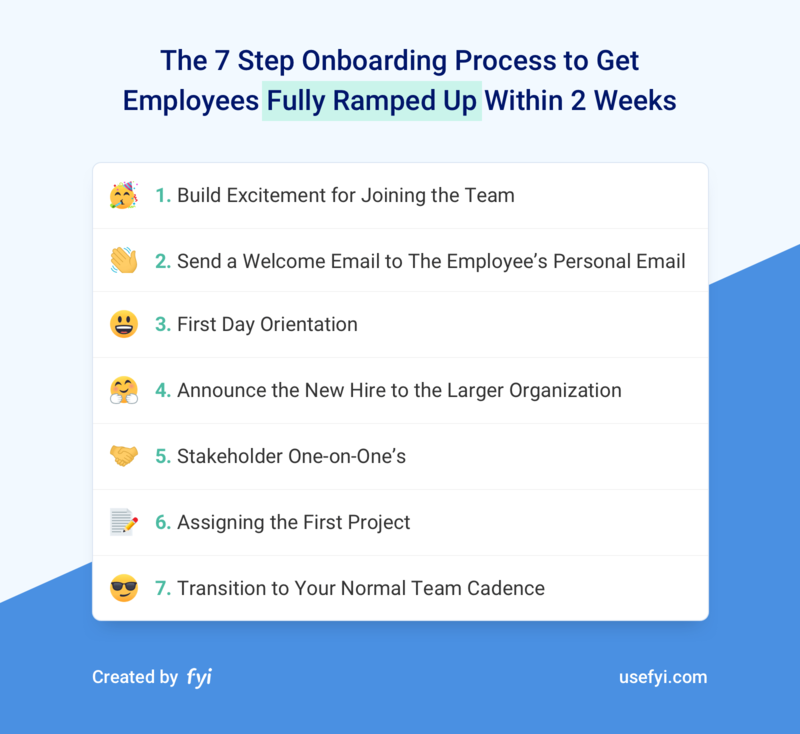 We use a 7 step onboarding process that gets employees fully ramped up within a few short weeks instead of the typical months-long process at many companies. It emphasizes pre-onboarding, the time between an employee signing an offer letter and their official start date. This is a great period to build momentum and excitement for the new employee. For the standard onboarding steps like filling out forms, orientation, and introducing people to the team, we make that as streamlined as possible. Most of our attention goes to picking and scoping the first project, this is one of the most important steps of any onboarding process. We’ve built our onboarding process based on our 4 onboarding principles, these are the core of our onboarding philosophy. Regardless of the exact steps that you choose to implement on your team, following these principles will dramatically speed up the time that it takes for new employees to get fully ramped up. Getting team introductions, the right one-on-ones scheduled, and team-wide announcements correct goes a long way to creating bonds quickly. As opposed to doing ice-breakers or trust exercises, we focus on making the introductions on behalf of the employees so there’s more willingness from everyone to reach out during a normal day. That’s the key to getting genuine work relationships built. Most onboarding processes are over-engineered by focusing too much on the orientation part of onboarding and not enough on getting the employee deeply embedded within their team. We choose to prioritize team bonds and real work instead. That’s a lot easier to do if the onboarding process is kept really simple. No one enjoys busy work. And one of the biggest motivators for all new employees is to see the impact that they have on a genuine project. The more you can get the first few projects to have a tangible and real impact on larger goals for your company, the faster you’ll get the new employee fully ramped up. As much as we want to get a new employee working at full capacity right away, we need to take extra care with the first few assignments. There’s a delicate balance between giving them real work and giving them a project that’s too challenging. Projects that are too challenging de-motivate employees by destroying their motivation and self-confidence. 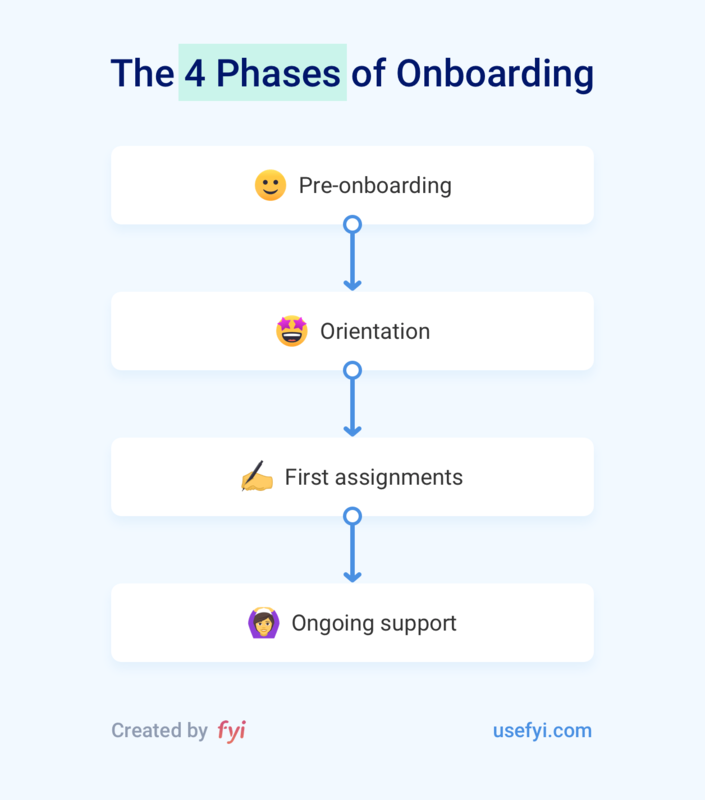 What are the 4 phases of onboarding? Pre-onboarding – the time between the signed offer letter and the first day. Most managers forget to focus on this critical period. Orientation – this includes the basic information sharing to the new employee, team introductions, and completing the employment paperwork. First assignments – the first few projects, especially the first one, need to be scoped extra carefully for new employees to help them get up to speed without overwhelming them. This is done within the first week or a few weeks at most. Ongoing support – when done effectively, the phases above get new employees fully onboarded within a few weeks. But there’s always an ongoing period of a few months while employees get completely comfortable. They need continued support from their manager and peers during this period. I’ve onboarded quite a few employees myself and if there’s one thing I’ve learned, it’s how easy it is to forget all the minor tasks that have to be completed each time. And with onboarding, forgetting a couple of seemingly minor items can set a terrible tone for new employees. We all take cues from those around us. If our companies are detail oriented, we’re more likely to be detail oriented. If companies set a high standard, we’ll set a higher standard for ourselves. Which means that if too many details are forgotten in the hiring process, new employees will pick up on that. Then they’ll worry about the details of their own work less, bringing down their work quality. What seems like trivial details actually has a huge impact. We put together a 22 item onboarding checklist that we always run through. This ensures that we set the right tone for all new employees as they join the company. There’s plenty of standard best practices like getting employees to fill out all the initial paperwork, giving them an office tour, and doing team introductions. We’ve included all of these items in our onboarding checklist. But what about the best practices that aren’t immediately obvious? The best practices that are hidden? Have everyone on your team send individual welcome emails to the new hire before they start. It’s a thrill to get a bunch of welcome emails from your new team. And no one does this so it’s an easy way to set yourself apart from other companies. Introduce the new employee to the larger org, not just their team. Lots of work crosses team boundaries and great employees know how to work across these boundaries when needed. Making the larger team aware of the new employee sets a foundation for these bonds to build naturally over time. Specifically request that the new employee meets with key stakeholders outside their immediate team. Bonds will develop within the employees team naturally but bonds outside the team take much longer. For key stakeholders that the employee needs to work with, get one-on-one’s scheduled within the first 1-2 weeks. Outline the expectations of the role as clearly as possible. It’s nearly impossible to go overboard here. As managers, we’re far more likely to under-communicate than over-communicate. Whatever expectations that you have for the role, even if you think they’re obvious, write them down and go over them with the employee during the first week. If there’s one thing to spend the bulk of your time on, focus on the scope of the first project. Don’t confuse orientation with onboarding. Orientation is about getting the employee up to speed on the basics of working at the company. Onboarding is about building bonds and learning how to make an impact on company goals. Let’s get on the same page with one important distinction. Onboarding is not simply an orientation. Orientation is part of onboarding. Specially, orientation includes the basic welcome activities when employees first join your company. For smaller companies, this might only be a welcome one-on-one with the employee’s manager and a tour of the office. Larger corporations set up structured orientation agendas for the majority of the employee’s first week. The more company policies that you have and larger your company, the more time it’ll take you to go through the essentials. 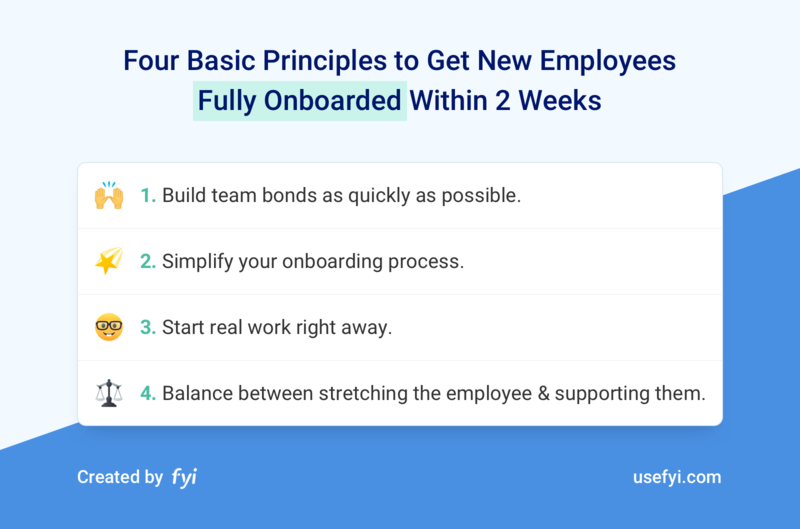 Onboarding, on the other hand, includes the entire process from a new employee deciding to join your company to that employee being a fully ramped up member of the company. At its heart, it’s about helping the new employee build bonds with their new team and helping them learn how to deliver work that has an impact on company goals. Some managers make the mistake of assuming that onboarding is just an orientation process. Once an employee gets the basic info on company policies and completes all the paperwork, they assume there’s nothing else to do. This assumption leaves a lot of potential wasted. Not only will the employee lack confidence for a longer period, it’ll take longer before their work moves company goals forward. The employee and the company both lose. If there’s anything to cut corners on, it’s the orientation part of onboarding. Make sure that enough attention is being given to the core of onboarding: bonds and impact. When using a lean onboarding process, I prefer to manage my onboarding within the day-to-day tools that I’m already using. G Suite, Office 365, a wiki, a document signature app, and a place to save your documents is all that you really need. If items are getting missed in your onboarding process, an onboarding checklist usually solves the problem. It’s also the easiest solution to implement. I only recommend that you consider a dedicated onboarding tool if you’re hiring a lot of people. The volume should be intense enough that even with a fully staffed HR team and a checklist, your processes are still getting overwhelmed. There’s just too much volume to catch it all. In this case, using an onboarding tool to manage the workflow could solve your problem. A lot of recruitment and HR software has onboarding features built in these days. So the first place to look is the tools that you’re already using. BambooHR and Namely are both good examples. There are also dedicated onboarding tools like WorkBright or ClearCompany that are worth considering. Our onboarding process completes onboarding within 2 weeks. First, I’m shocked that a quarter of all companies spend a day or less for onboarding. This basically means that new employees are left to fend for themselves. This can be overwhelming for most people. At best, this means lower productivity. At worst, it means lower employee retention. 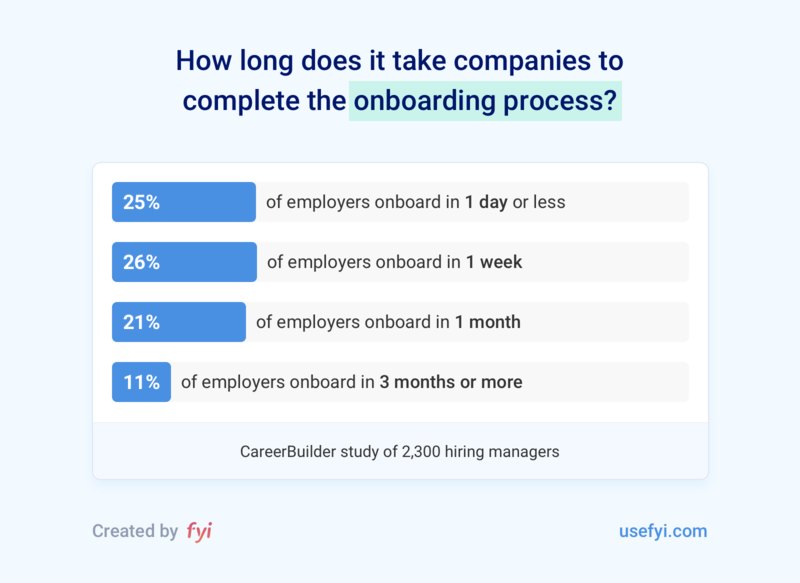 About half of all companies are spending between a week and a month on onboarding. I consider this to be the normal bounds for how long it should take. While I prefer to get formal onboarding completed in one or two weeks, it’s completely reasonable to extend it up to a month for more complicated roles. As for companies that spend 3 months or longer with onboarding, I suspect many of these onboarding programs have been over-engineered.